Dr. Jack Sutree (Grinnell Morris) is a biochemistry professor whose life is turned upside down when a lab accident gives him the ability to visualize his olfactory. If he looks at a flower, its fragrance is represented by a colorful cloud. Oddly though, when he looks at a person he is able to see their true motivations. He can see their innermost thoughts and secrets. It's a powerful and frustrating gift. With the assistance of a homeless musician named Bazemint, Jack hopes to unlock the mystery behind his powers and stop big pharma from using Jack's discovery for nefarious purposes. 96 SOULS fits in nicely with science fiction exploitation from the 50's and 60's. The science isn't very sciency and the fiction is super fictitious. The saving grace of most exploitation films is in the themes they explore. The reason a film like INVASION OF THE BODY SNATCHERS transcends a silly plot is the exploration of cold war paranoia. While 96 SOULS never reaches BODY SNATCHERS levels of greatness it clearly has something bigger on its mind. Grinnell Morris is given the difficult task of delivering most of the films clunky exposition and manages to deliver a grounded but slightly off-kilter performance. Morris's Jack is the audience's proxy. We see the absurdity of this film through his eyes and given permission to have a good time, as long as we remember not to ask too many questions. 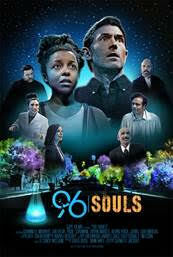 Make no mistake about it, 96 SOULS is an exercise in idiocy that could turn many viewers off. But, I have a feeling it could also find a strong niche following. Certain audineces aren't as concerned with polish as they are with originality. They can forgive a film's sins if it has something interesting to say, or says that thing in a new way.